To celebrate the return of the Food Lovers' Village Mysteries with book four, TREBLE AT THE JAM FEST (June 8, 2017, Midnight Ink), I'm offering two signed copies of the first in the series, DEATH AL DENTE, winner of the 2013 Agatha Award for Best First Novel. Leave a comment below to enter. The annual Jewel Bay Jazz Festival returns! Visit Jewel Bay, the gem of a village on Eagle Lake in Northwest Montana, for a week of jazz featuring all your favorite styles, from guitar to brass to Gypsy jazz and more! The fun begins Sunday in Riverfront Park with a sampling of the week’s offerings, including international guitar sensation Gerry Martin. Bring a picnic, kick back, and drink in the music in a sparkling outdoor setting. Concerts continue nightly in the Playhouse, where treasured artists from across the country will entertain you. Don’t miss the student concerts and open mic nights scattered around the village, where you’re sure to discover a diamond in the rough—or two. While you’re visiting Jewel Bay, the Food Lovers’ Village, enjoy breakfast at the Jewel Bay Inn, linger over coffee and genuine French pastry at Le Panier, and visit the Grille for the best Reubens this side of the Rockies. Dine at the Inn, Applause, or Chez Max, or take home a picnic basket stocked with delectable taste treats from the Merc. Shop in the village for books, children’s toys and clothing, and more. Jewel Bay’s galleries feature painters, potters, glass artists, and sculptors from around the region. Hike, fish, kayak, sail, golf, and enjoy the wonders of Glacier National Park, only a thirty-minute drive. You’ll take home more than treasured memories when you visit Jewel Bay, Montana’s crown jewel! Tell me about a music festival or concert you particularly love or remember! Leave a comment below for a chance to win two signed copies of the first Food Lovers' Village Mystery, DEATH AL DENTE, winner of the 2013 Agatha Award for Best First Novel. US and Canada only. Winners will be chosen May 1, 2017. 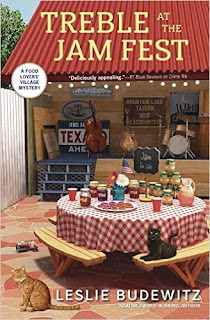 Leslie Budewitz is the author of the Food Lovers’ Village Mysteries and the Spice Shop Mysteries—and the first author to win Agatha Awards for both fiction and nonfiction. 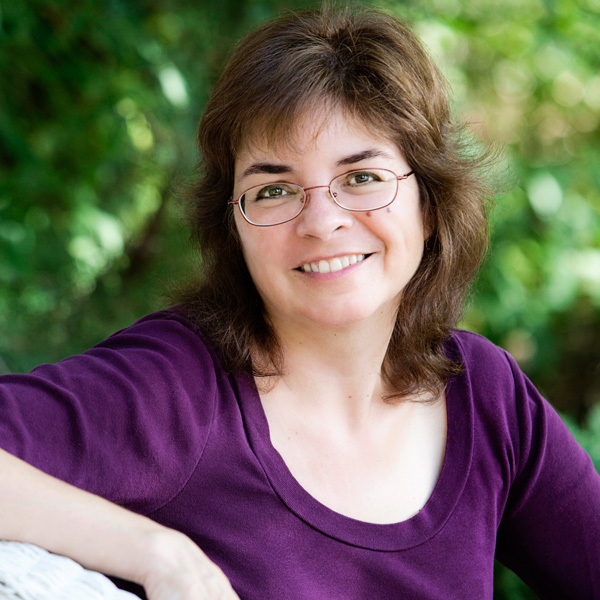 The past president of Sisters in Crime, she lives in northwest Montana with her husband, a musician and doctor of natural medicine, and their cat, an avid bird-watcher. The only famous person concert I've been to was Ty Herndon at the local Blind Horse Saloon. It was a surprise to me from my husband but since I've always been a fan of his it was ok. Thank You for the review and the chance at the great giveaway! One of our favorite local musicians plays Living in a Moment in all his performances, and it's a good thing I like it because it's quite the earworm! What fun! But talk about earworms -- although there are a few Kenny songs that stick, aren't there? I hope you'll enjoy the snippets of music in TREBLE! I love going to music festivals. I have been to several that featured many different bands. That's the best part of festivals, isn't it -- the chance to hear so many different artists. Ha -- I sit at my desk drooling! All in the service of my readers, of course. If it makes you hungry, I've done my job. And you lived to tell the tale! My then 16 y.o. husband drove by it with his mother -- on the way to see Peter, Paul & Mary, so not a bad trade-off! The only Concert I have been to was when I was like eight or nine years old. It was a Kiss Concert. I fell asleep like 20 minutes into it. I remember more about the crowd of crazy Kiss Fans. I also remember seeing Beth live, and that will always stick with me. This was in the 90's when they got back out there. philski155a (at) aol (dot) com. Thanks for the opportunity. Now that's hilarious -- The Boy Who Slept Through Kiss! I already have the first book. Leslie is an amazing writer! I have all of her books and can't wait for this new one! Keep up the wonderful work Leslie! That's one I would like to see -- I hear he puts on quite a show. Thanks for the chance to win! My grandma read this series and loved it and it's on my to read list. I love your Seattle Spice Shop series more than words can express!!! I'm sure this is just as great! Congrats on the new release too! As for a concert, I'm very limited in that but the most memorable was a country concert to see Trace Atkins when I was about 7 months pregnant with my daughter. It was a blast and once she was born those were the songs that calmed her down the quickest. Funny how that works. Thanks for the kind words, Amanda! Some readers prefer one series to the other, but gosh, I love them both -- go figure. And I LOVE that story about your daughter and the songs that calmed her down! ShaNaNa - many years ago and was such fun! Also Kenny Rogers, Dolly Parton, Johnny Mathis, Neil Diamond among others. We'd love to see Jimmy -- Mr. Right plays quite a few of his songs in his own sets. When I was a teen I went to a Loretta Lynn concert----she really had talent. What a treat that must have been! I greatly enjoyed and have fond memories of the "Jazz Festival" at Old Towne Sacramento. My husband and I went a few years in a row including one year staying at the Delta King Hotel to get the full experience. With various jazz (Dixieland and Big Band style) bands from all over the world we really got our fill and even got in some wine and food tasting and dance lessons, too! That sounds terrific! Dixieland always makes me smile. My sister and I went to a Country Music Festival on a Saturday in June. The day before the festival the area had received a great deal of rain. Thinking everything was ok, we parked in the feild at the bottom of the hill that was being used parking. We were enjoying the music when they told us to move our cars because the field was starting to flood. By the time we got to our car, we had water in the car and it was too late to get out. We had to walk thru waist high water to get to the fair grounds. By this time it was almost midnight and we had to find a ride home. My sister and hundreds of other people lost their cars in the flood. Her car was towed out of the field a week later and it was a total loss. Oh, good heavens -- thank goodness only cars were lost. Preservation Hall Jazz Band - fabulous! You lucky dog! I walked by the Hall last Sept but couldn't get to a performance -- from the street, you would never imagine what music those walls have heard! You loved it, and Ben fell asleep -- the tale of 2 8 year olds! Lucky you! One of the pleasures I discovered in college in Seattle was classical music -- a girlfriend and I would pay $8 for seats up front when season ticket holders turned them in. Great memories. I have never been to a music festival, it would be treat to go to one. I like the storyline of this book and would enjoy reading it. I hope you get to go -- on the page! Every year, I attend the Hot August Blues Festival held in Aurora, KY, which is about 15 mins from my house. It last for 3 days and is held outdoors. Always a blast!! That sounds terrific, Johnna! I saw Doc Watson play, with Merle and the band, at the short-lived Big Mountain Festival 20+ years ago, and still treasure that memory. We were so lucky in college to see a lot of the performers who later became Superstars (hey! no years, please). Dianna Ross and the Supremes, Johnny Mathis, Neil Diamond, etc. The tickets were so cheap even poor college students could afford them. My first concerts were by my husband's band, obviously couldn't miss those! Then when we had our daughters back in the 70's I had to chaperone a concert at the NJ meadowlands where the original Backsteet Boys were performing. I must admit, they did a great concert and all the girls swooned. Then when we left and were pretty much alone in the parking lot, my battery was dead, what an experience. We survived! Thank you for the chance to win this book! Merry Northstarvance(at)Gmail(dot)com. Thanks, Doward -- and yes, I hear Tom Jones put on quite a show! Mea culpa, friends! I wrote a long response using my Kindle Fire while I was traveling, and it disappeared! But I'll catch up shortly and do the giveaway, now that I'm home from Malice Domestic. Happy, but very tired! I went to a conference once that had a golden oldie band and Mark Lowrey spoke and sang his song, "Mary Did You know"
Thanks for sharing your memories, friends! Waiting to hear back from the winners. 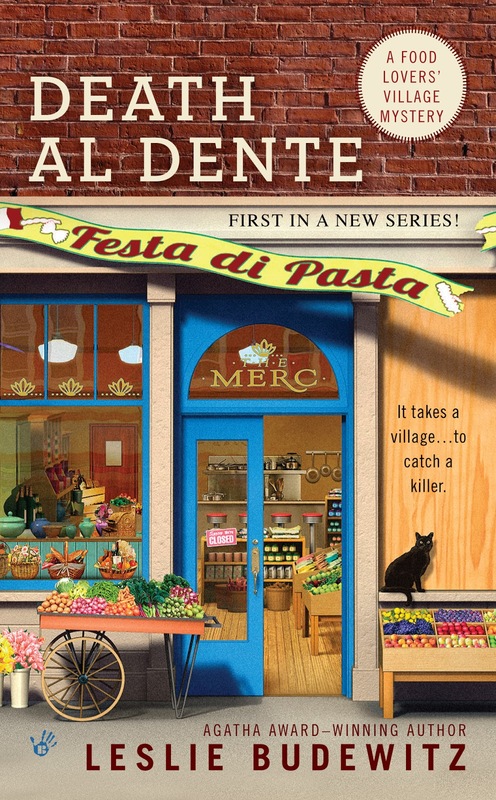 CONGRATULATIONS to Barb W and Taurus, winners of signed copies of DEATH AL DENTE! Thanks to all of you for joining in the fun. Wishing you a summer filled with great music and memories!